Image Courtesy : NP Bridging. The masterplan focuses on two major aspects; an alignment of a necessary bypass for Mumbai’s truck traffic entering the city and a conceptual Master plan for the 31km waterfront within the Thane Municipality jurisdiction. 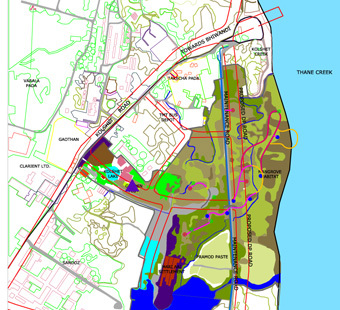 The main purpose of the study is to provide Thane Municipal Corporation with a Master plan to serve as the basis for the development of open spaces, urban spaces as well as the enhancement of amenities and recreational op¬portunity within and adjacent to the Thane creek and Ulhas river. 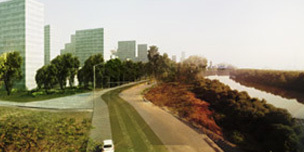 The Thane Masterplan envisions a waterway that is healthy, partly accessible to the public and active with wild¬life. The plan provides guidance on how the River and the Creek can affirm themselves as the focus of North of Mumbai and become a new identity to the city asset to the entire community. The master plan takes into account the following aspects. To define a specific urban identity. Propose an urban structure for entire Valley based on ecology and green open spaces. 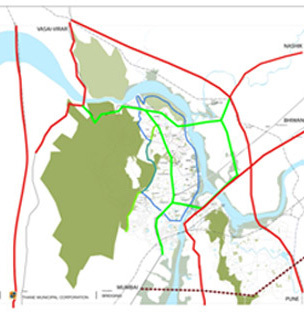 The strategic location of Thane at the intersection of infrastructures and rivers presents an unique potential. Between the mountains of Sanjay Gandhi National Park and Ulhas river, Thane is the main northern gateway for Mumbai. 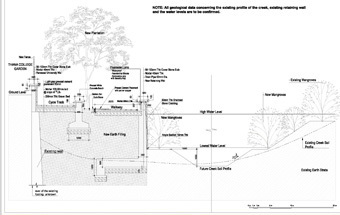 Also the 31 km stretch of the creek front is a vast lung available for the city, with a potential for navigation and recreation along with biodiversity conservation. 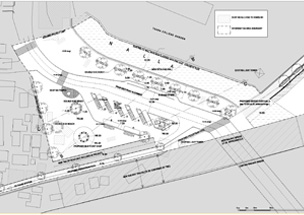 Thane Municipal Corporation initiated the investigation of a Waterfront Master plan, with an aim to revive the water front and utilize the available resource to its potential. The Waterfront Master plan is a cornerstone plan, prior to any general master plan or vision plan for the entire valley, and it has to cope with larger concerns beyond it’s own project area. 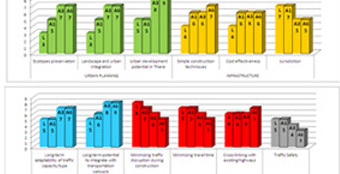 Through this the TMC desires to propose new visions, methods and tools for planning in MMR (Mumbai Metropolitan Region).